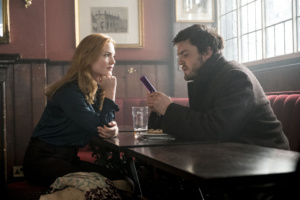 Lethal white publication | Page 5 | Discuss Cormoran Strike! Yes the it progresses thing was what made me go hmmm, maybe she only mistakenly typed lethal white, as she wouldn't type it before. And yay if it's the 4th which is the most complex!!!! With her tweets they were so ambiguous it's annoying, but I do love it when it comes to teasing plotlines though. And I wouldn't be surprised if she's had a wager here, as it's known she does for hp websites, and even went on one of their podcasts before. I think she said on that podcast I just mentioned that she likes to see how the 'real'(joke) fans feel about stuff and see the theories and stuff (this is off memory), so I could be breaking the 4th wall right now 😂. Uhhhhhhh, interesting! Do you realise that this supports the theory, that the book does not necessarily have to start with the wedding, because there are many other crucial events to choose from that are way before the saying of the vows? It would make more sense for me if LW started right after Matt deleted the voicemail and call history. Now... does anybody remember the above the way I do? Or did I simply made up the last part of her sentence (the one about not torturing the readers)? "She's also told me that the story will pick up straight after a crucial event at the very end of Career of Evil." "Last year, the author revealed to the BBC's Lizo Mzimba that the next book would pick up immediately after the events at the climax of the third novel, Career of Evil." By the way, do you notice the words "crucial event" and "climax" in the quotes? For me it also supports that the last chapter of CoE is a cliffhanger. The waiting wouldn't be so bad if she hadn't ended CoE with such a cliffhanger (or wasn't it a cliffhanger?) It's the suspense that's killing me. If only I could read the first chapter of LW, I would be perfectly happy to wait a few months more for the rest of it. I think we all are those people 😉 And no, I'm not ignoring you; I just felt that the forum is not for drama. and as every side has voiced their opinion, I felt it unnecessary so dwell on the issue. But just to be perfectly clear: I do not have a problem with an opinion different to mine; in fact, I really enjoy reading another perspective. What I do not enjoy, however, if a different position inserts itself through ridicule and dominance, rather than arguments and logic. But, as it's always difficult to properly judge someone's written tone (especially in another language), I might have over interpreted your shouty exclamation marks. 1. Because I dated a man with Matthew's character and I concider a win for a woman even if she leaves him one minute before the ceremony is completed! 2. I'm a hopless romantic 🙂 so it sounds kinda "poetic" to me if Robin doesn't get marrried (Cormoran didn't make it to the finish line with Charlotte) so it will be a first for them both! As for my comments for the honeymoon scene I tried to explain with an example where I expect to find such scenes and why I concider them a bad idea for a crime novel since it doesn't involve the individuals who are solving cases! If Robin and Cormoran went for their honeymoon I would see some sense since they could find their new case while away! I personally when I read crime novels expect more to the case relevant things! For example in The wolf lake by John Verdon the detective is on his way for vacations with his wife but they make a stop in a resort where a murder took place and have some moments together but it was during him solving a case so I didn't mind! That doesn't mean that nobody enjoys such scenes in a crime novel even if it's between irrelevant individuals to the main story! I hope I explained better myself now! Guess I'm the one of those people, so thanks! 🙂 But what's more important to me than Strellacott and nobody seems to notice is for Robin to find herself, something she can't do while being with Matthew! As very well said by Cormoran "the price Robin had to pay to be with Matthew is not to be herself"
Sorry that you try to ignore me and I still write my thoughts but that's what a forum is about! Also when you write your opinion publicly some might disagree with it! Many disagree with my opinion that Robin could leave Matthew at the later because it doesn't sound realistic, what should I feel about it? I really admire your positivity! Being ever the pessimist, I instantly focused on another tweet where she said, that the 5th Strike would be a couple years from now (sigh) But you're right, of course - the longer the better. I love a good long book, do you know whether she ment book 4 or 5 when she said it's her most complex? I love complex story's so I'm hoping it's book 4. I actually thought she might of just finished the book so gone on a bit of a Twitter spree about it, so it was an apology? If so maybe an October release? I read her tweet as an apology for still writing. It's really exciting to see her tweet about how long Lethal White is (she comments that her 4th book in each series has been the longest). I can't wait to just be totally immersed in it and the longer it lasts, the better! I was just trying to work out whether her tweets mean she has finished it or not, she typed out lethal white which should confirm it but she also said about progressing it in another tweet so idk.